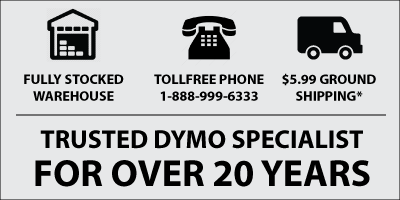 - The Dymo LabelWriter 450 Label Printer is compatible with most Dymo LabelWriter Labels. Connect the DYMO LabelWriter 450 label printer to your Windows PC or Mac, install Dymo's free software, and you're ready to print impressive address labels, shipping labels, file folder labels, name badges, inventory labels, barcode labels and more, all without the extra work and hassles of printing sheet labels on a standard desktop printer. Conserve power with new "sleep mode"
Starter Roll of address labels. Note : Labelcity is authorized to ship this item to USA and Canada addresses only. We cannot ship this item to any other country. - It isn't compatible with the LabelWriter 4XL labels nor is it compatible with Dymo Stamps. Very impressed. Downloading the software and creating a label were very easy. For the price, the quality of the print was fantastic. Love this product! We use these printers for our customers to print visitor badges and they work perfectly!!! Easy installation, have 8 in our office and never had an issue. Does what is suppose to do and quick. We love this printer. It is so reliable. I use it every day. It is amazing. best price at Label City. We have 6 of these and we are ordering another. Everyone wants one at their desk to print appointment cards. Fast, easy, and efficient. They work great! Great little printer. I use it so much to label all the odds and ends thing in our office. I use my printer mostly for printing the tiny multi-purpose labels for pricing my items. The labels print very fast. It has never jammed unless I did something wrong. Changing labels is easy. If you just need black and white labels this is a great little labeler. We have used these printers for our children's check-in area at our church for over 10 years. They are durable machines and print well. I would recommend them to anyone looking for a reliable label printer.